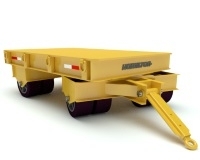 Hamilton's robust line of heavy duty in-plant trailers, carts, and trolleys guarantees the right towable equipment for your material handling needs. Custom designed and built with electric motors and drive systems. 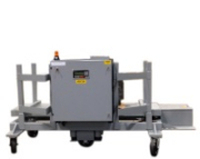 Fixed or variable speed control, flat decks or custom fixtures, load capacities 2,000 - 40,000 lbs. Hamilton prides itself on manufacturing industrial grade specialty carts to address specific applications within the material handling industry. 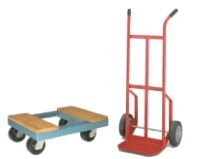 Hamilton's line of industrial platform carts, shelf carts, wagons, & johnson bars for the best hand-operated material handling equipment for warehouse, plant or shop. Drum, furniture, & cradle dollies, plus heavy-duty wood dolly. Hand trucks made tough in the USA. Select among steel, aluminum, or stainless.